Drip irrigation is the most efficient form of watering as water is delivered exactly where it is required, without wasting a single precious drop of water. Virtually no water is wasted through surface run off or evaporation and plants have time to absorb moisture down to the root system. 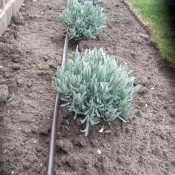 Drip irrigation can be used above or below ground and is frequently used for watering beds and borders. 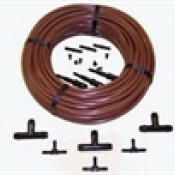 ECP Group has drip irrigation products suitable for a wide range of applications which will make watering less of a chore. 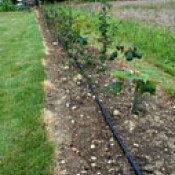 The drip irrigation system can be automated using a timer so the system can be left working automatically without the worry of the watering system being left on (or even worse left off!). Drip irrigation systems are used throughout the world especially in countries where water is at a premium and where they want to accurately use water with as little wasteage as possible for gardens, landscaping and agriculture. 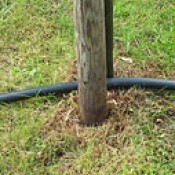 Isn't it time you moved to drip watering? 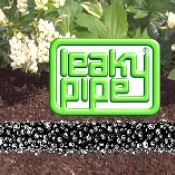 Please view our Drip For Containers section for pot watering, hanging baskets and other container irrigation systems. If you cannot find what you are looking our are doubtful of your requirements then please contact us.